Nic, this looks delicious and what a great blog event. Nic, this is a splash of beauty! It's so simple but so delicious looking! Beautiful! It caught my eye on Tastespotting and I didn't realize it was yours until I saw it in my reader. Great use of yellow! Wow that is a fabulous photo. I love it. Great recipe too. Thanks for supporting LiveSTRONG With A Taste Of Yellow. Great photo and such a refreshing treat. Nic that looks so nice - a great photo. What a feast for the eye....I would have loved to taste this. Lovely stuff. This is a great event :-) I wish I had time to participate - my mom's a melanoma survivor, my aunt survived cervical cancer, and my grandmother died from breast cancer that spread. But time is not in abundance for me this month so I'll just have to check out other people's fabulous recipes! Fabulous. 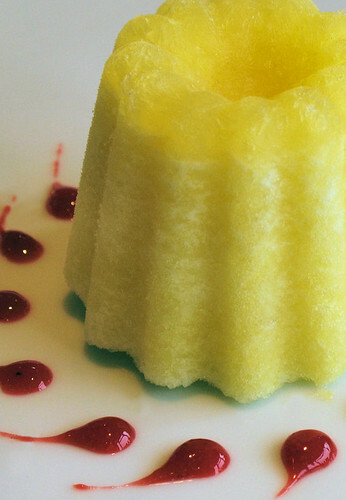 The pineapple sorbet you have presented definitely has the wow factor. What a brilliant photograph. This looks fabulous and sounds so much simpler to make than I would have imagined. Bet it is delicious. I'm not sure I could make it look so pretty though! You make me want to run out tomorrow and go get a pineapple. Simply beautiful! Sylvie - thanks and hope you are going to join in! Patricia, Shari, Brilynn, Gretchen - thank you! Barbara - thanks and can't wait to see the round-up. LyB - I can't wait to make a few more recipes from that book! Thanks Pixie, Jan, Nina and Rosie! I wish we could put more hours into the day sometimes! Maria, Margaret, Antionia & Cynthia - thank you! Lovely work, Nic, especially going the extra mile with the dried pineapple ring -- the effect is really stunning! I can't decide which looks the most beuatiful...your photo or the recipe..a lovely post! 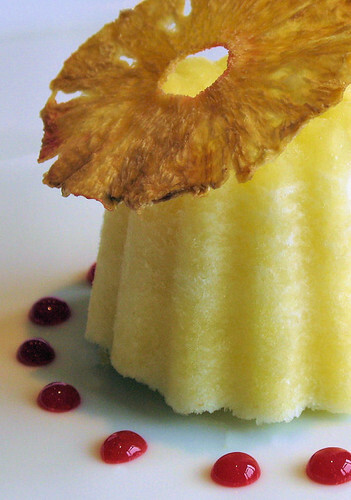 I like the esthetics of the dried pineapple ring on top of this delicious sorbet Nic. The perfect recipe for the Live Strong Event! !A trul worthy cause. That just looks so pretty - I love the effect with the sauce drops. Pineapple sorbet sounds so refreshing too - yum! Wow! That is stunning. I love pineapple. That tropical taste is so summery. I am ready for summer too! I'm not a fan of pineapple - something about the texture of it - but I would LOVE to try this! that looks gorgeous...very professional! and good on ya for supporting such a good cause! JJ - thank you and thanks for visiting! Valli - thanks, and yes - this is a great event for a worthy cause. Alfie - I don't usually do sauce drops, but I think I need some more practice! Cooking - thank you for your visit! aforkfulofspaghetti - mmm, it is quite pineapply, you would need to really blitz up the p'apple well to make it very smooth. How lovely! Never mind the sorbet - I just want a bowlful of those baked pineapple rings!! Gorgeous pics. That looks really delicious. I'll try to make my version of this delight one of these days.